Manage registrations and stop spam users on your website. Joomla different user group on registration. With Improved Registration you can manage Joomla users registrations by creating simple rules. You can, for example, block all users with an email address of a certain domain, or accept only users with defined usernames, or also assign user to user group automatically on Joomla based on email address and username. How to stop fake users from registering? Improved Registration can help you to prevent spam users registration on Joomla website. Create a Joomla user blacklist. Create a Joomla user whitelist. Assign new users to a different user group automatically. Allow or deny user registration based on email address. Allow or deny user registration based on user name. 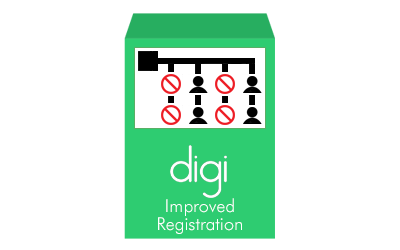 Improved Registration can assign user to different user group based on the domain of their email address. Also, in each rule made by yourself, you can read in a message the effect that the rule will applies to future registrations. Remove unneeded fields verify password and confirm e-mail from Joomla Registration form. Improved registration can simplify the Joomla registration form by remove unneeded fields from Joomla registration form, such as "repeat email" and "repeat password". Several studies have shown that the simplicity of compiling a form, is the base for an excellent conversion factor, because often when an user has difficulties to fill a form, or the form is too long and boring, the user switch the page, or the worst, switch to another website. By this component, you can turn on user registration by email in Joomla, which allows to not enter as a must own name and own username during the registration process. Email address can replace username. The field "repeat email" can be removed. The field "repeat password" can be removed. By using Improved Registration you can setup a registration form where users will be able to sign up by just two fields, email address and password. To setup the component the first action to do is to turn on the associated plugin Improved Registration which will manage all the options selected in the component; without this plugin the component cannot run. Then you must setup Improved Registration options. You can open component options from component menu or by Option button in the right up corner in component view. In Registration form tab you can manage how the registration form of your website should look by show or hide some fields. By Hide repeat email option you can remove repeat email field from registration form. By Hide repeat password option you can remove repeat password field from registration form. By Name is username option you can remove name field from registration form and use instead username as name. By Email is username you can remove username field from registration form and use instead email as username. In Users registration tab you can manage registrations. Here you must select from BLACK LIST or WHITE LIST. This general rule will be used for every rules you will create in the component. You can block all users but allow to some users to sign up by the whitelist, or you can allow registrations but block some users by the blacklist. Here you can select the general behaviour of the component. Then you can create rules to define which results you want to achieve. By Check username option you can select to check username during the registration process. By Check email option you can select to check email address during the registration process. By Assign usergroup option you can automatically assign new user to selected user group after the registration process. By Redirect URL you can redirect users after a denied registration. Can this extension make easier the registration process? Yes, you can hide "repeat email" and "repeat password" fields, and you can let users to register by email address instead to use username. Can this extension block users in the registration process? Yes, you can setup a blacklist of usernames and emails to not let them to register to your website. Is possible to assign email from a domain to a different user group? Yes, you can create a rule to assign one email address or all email addresses from a domain to a different user group. Can this extension restrict registrations only to email addresses from a singe domain? Yes, you can setup a whitelist, so only usernames or email addresses in the list can register to your website. Myway for sorting. Functionality: A tool to sort user registrations - depending on name or mailadress. It offers me a great option for my webpage. Ease of use: Shortly look at it and it is understood - first steps are very easy and even some special things just need some clicks. Support: I had some questions for additional functions / ways of work - the answer were fast and the tool got an update with new functions. Documentation:Even if it not really neeeded: Mostly everything is documented - and if there is a question, the forum and support reacts fast. Value for money: This tool saves me a lot of time, because i can work with lists. So it's value is great for this little price. I used this to: A Booking website for diffrent companys. This tool sort the Users to theire usergroup, depending on diffrent parameters.